Over 6 billion hours of video are watched each month on YouTube – that’s almost an hour for every person on Earth, and 50% more than last year – and that’s just one of the awesome facts about how many people use You Tube. Are you using You Tube? Your supporters almost definitely are. Facebook claims to have over a billion users, and your supporters are probably looking at their newsfeed most days and interacting with posts. Twitter has also had a huge growth in the UK with nearly 50% of adults saying they use it and the UK comes second across Europe for social media use. Social media is HUGE and it’s here to stay. You don’t need to jump on board with all of it and spread yourself too thin, but it is worth telling your stories using digital media. It’s a great way to connect with your supporters, tell them what you’ve been doing, post pictures and create a compelling story about your success and achievements. Use Facebook to start discussions and encourage engagement with your followers, respond to questions and discussions and engage in a meaningful way with people who post on your page. 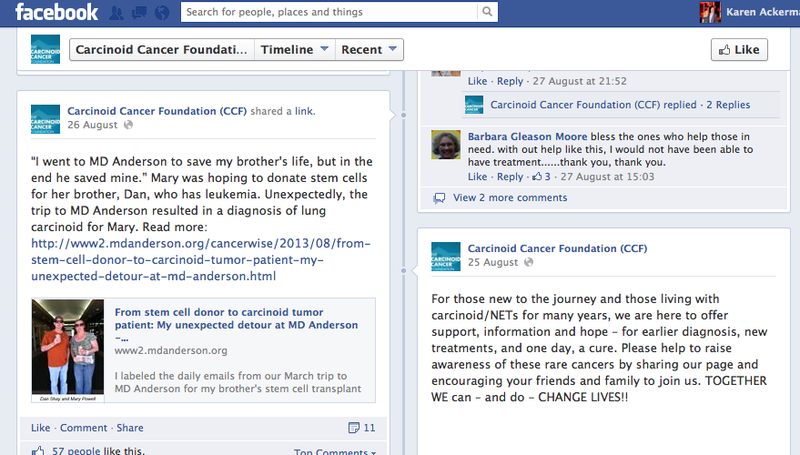 The Carcinoid Cancer Foundation use their page to post stories about people with the disease and build up a real community of people who can support each other, share experiences and support the organisation. Don’t just advertise and push out information about what you are up to. Don’t you hate it when your Facebook friends fill up your timeline boasting about their great kids, cute dog or amazing holidays? Well, treat your Facebook page exactly the same way as you do your own timeline, engage, comment, share and be interesting. On Twitter you only have 140 characters so use them well. Links work well on Twitter, so posting links to blogs, pictures or films is always worth doing. Twitter is also a great way for real meaningful engagement, treat it as if you are at a party, don’t just talk at people, listen, respond and have a real conversation. Twitter is a great way to share your unique knowledge, if your organisation has an expertise in a particular area then share it and become established as an expert in your field. 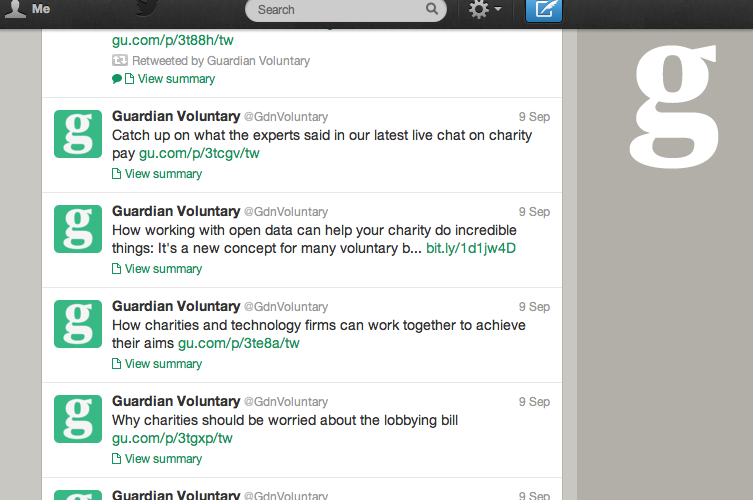 Guardian Voluntary use their Twitter feed to share insights and knowledge about the voluntary sector. Most importantly on Twitter be interesting, funny or different, if it doesn’t fit one of those categories, don’t tweet it. Do you want to find out more and get some great tips on digital storytelling? Media Trust are running a conference in November that is shaping up to be a fascinating day. You can buy tickets here and come and join my workshop on using digital storytelling to increase your impact with your followers and supporters. Even better, you can come for FREE!! I have one ticket to give away! I am going to hold a draw on October 7th to choose a winner. To enter the draw, you just need to Like my Facebook page or join my newsletter list – or do both to enter twice! Previous post 5 top tips for using case studies to tell your stories Next post Telling your story before you get to the ground floor.